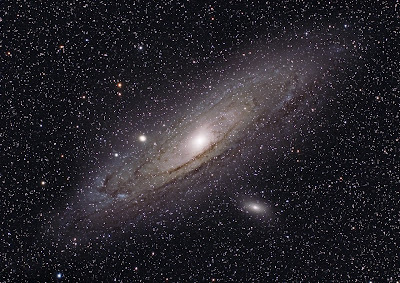 This is M31, the Andromeda Galaxy. Andromeda is our closest neighboring galaxy. In fact, we are getting closer all the time. Scientists predict that our galaxy, the Milky Way, will eventually collide with Andromeda. When that happens, there is actually a chance that our solar system could be "captured" by Andromeda -- we could actually swap galaxies! We won't know for sure for a few million years, but place those bets early. Another interesting fact about Andromeda and its distance and size... Since light takes time to travel through the universe, the further distances we see, the "older" the light is. In other words, if we look at an object that is 100 light years away we are actually seeing light that is 100 years old -- we are seeing that object as it was 100 years ago. Hence, we are looking into the past. The light traveling from the far side of Andromeda left before man ever walked the Earth, while the light on the near side of Andromeda left after the first recorded history. So, Andromeda is also an amazing "time line" of man's existence. Pretty cosmic, huh? 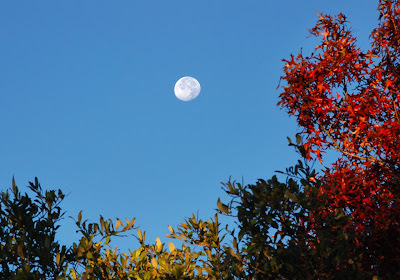 Anyway, I took this image last October at Rancho Venado. I had a couple of false starts, but finally was satisfied with this image (I haven't done too many galaxies yet). It was taken with the FSQ 106ED with a total exposure of 110 minutes. Cloudy Nights is a great forum and resource for the aspiring astronomer and/or astrophotographer. The competitions are friendly and fun, with bragging rights and a t-shirt the ultimate reward. Plus, the winner gets to pick the next "object of the month". It is a great way to challenge yourself and work on your skills, as well as see other folk's take on a similar object. What, ANOTHER telescope? Why do you need another telescope?! The answer is simple... why do you have a screwdriver AND a hammer? The right tool for the right job! My Takahashi FSQ 106ED telescope is alive and well and will continue to get a workout for many years. 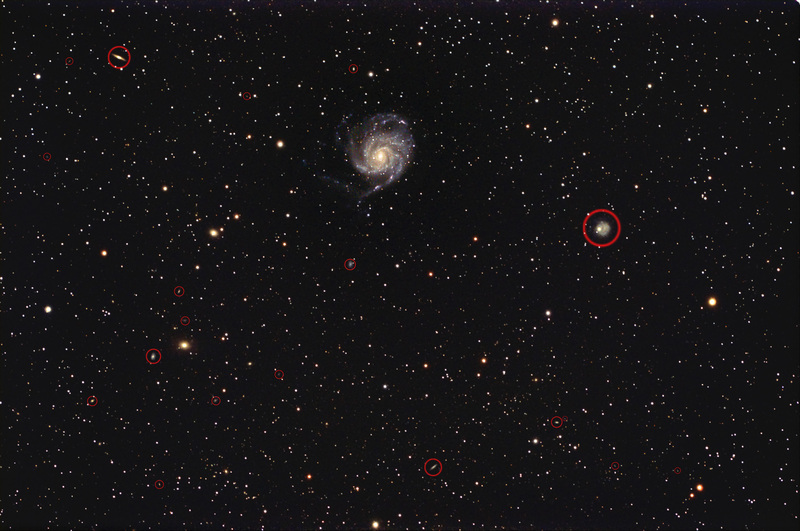 But the Tak is a wide field scope for imaging large objects. To image SMALL objects I need a much longer focal length (think of it as changing lenses on your camera). Galaxy season is coming up and there are not that many wide field targets in the spring, so this time around I will be ready! After much debating, I settled on a Meade LX200 ACF 10" SCT telescope. It has a long focal length, larger aperature, flat coma-free field, and a mirror lock. In other words, it is a good choice for narrow field astrophotography. I am still putting this rig together. I am slightly worried about the weight on the mount, but the Tak mount is pretty darned robust. I may go with a lighter guidescope (the one on top), but for now I'm going to give this a try and see how it performs. Well, I have been out of the country for a couple of weeks (Kim and I took a cruise through the panama canal -- neato). But before I left town, I managed to get up to Atoka for a couple of nights. At last I can process my images! The first night in Atoka was perfect, and very cold. The next night started well, but clouded up as I tried to image the California Nebula. So I packed up early and headed back to town around midnight. It is a bummer to bail on a session, but the upside is a nice warm bed! 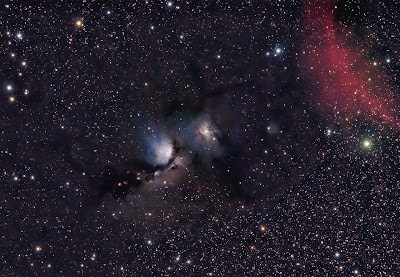 Anyway, the image before you is M78, a reflection nebula in Orion. I shot this with the FSQ 106 taking 11 x 20min exposures for a total exposure of about 3.6 hours. As I was processing the image I noticed I had captured an arc of red nebulosity in the upper right corner. I was not sure what it could be. But as I worked on pulling out the details, I was struck by hunch. After researching a bit I discovered my hunch was correct -- the red arc is part of the famous Barnard's Loop! Most images I see of M78 are close-ups. But since my field was wide, I picked up the Loop in my shot as well. I knew the Loop was in Orion, but I had no idea it was so close to M78. It was really fun to "stumble upon it", then figure out what it was -- like making a discovery (even though all seasoned astronomers would certainly know exactly what it was immediately). "When you make the finding yourself - even if you're the last person on Earth to see the light - you'll never forget it. "-Carl Sagan. Every year I go deer hunting with my dad -- an annual ritual since I was a kid. But in recent years I do most of my shooting with a camera. Hey, I still love venison (grew up on the stuff) but I am now content to simply watch the deer frolic and take photos. For me, the greatest thing about hunting was simply getting outdoors and watching nature do its' thing. Getting up early and climbing a tree before the sun comes up (freezing cold! ), then watching patiently as daylight breaks and the world awakens. Animals of all sorts emerge to begin their daily routines, while the rising sun slowly warms you. It is spectacularly beautiful and sedate. Once again I look towards Orion. This time to the famous Orion Nebula. This large nebula is a star factory -- birthing stars from the bright hot core. I went deep on this object to try to pull out a lot of the surrounding darker dusty bits. There is so much dynamic range in this object, I shot my sub exposures at 3 different lengths (30 sec, 300 sec, and 1200 sec) and then combined the results. All total there is about 2 hours on this object. You can actually see this object with your naked eye (and much better with binoculars). Looking at the Orion constellation, this object resides just under Orion's Belt and makes up the "sword". It appears as a faint, glowing cloud to the naked eye (best seen with averted vision). My hope is to continue mining the gems in Orion, then combine them all into a widefield image. 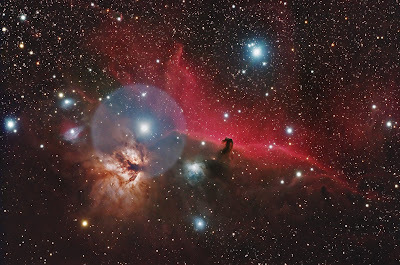 This is the famous Flame Nebula (lower left) and the Horsehead Nebula (should be obvious), as well as several other reflection nebulae scattered about. This is a very rich field full of lots and lots of wonderful sights. It has a LOT of dynamic range (very faint stuff next to very bright stuff) which makes it a challenge to process. Approximate exposure time is just under 2 hours. I took this shot with my usual rig (FSQ scope and QHY8 camera) at Ranch Venado over my Halloween stay. That's right, I was out in a dark field in Texas collecting photons of the Witch's Head nebula (otherwise known as IC 2118). 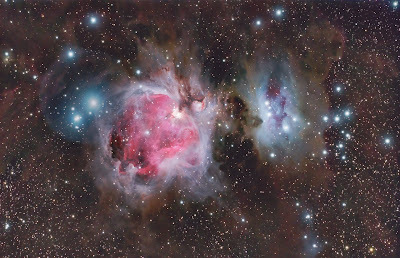 It is a large reflection nebula in Orion, and it is very faint. This image was taken with just under 3 hours of exposure -- and I could have used an hour or two more. But I'm pleased with it. And it was fun shooting this witch at the witching hour on Halloween night. It was a great "theme" night! Kim and I (and our dogs) stayed 3 nights at Ranch Venado where I took full advantage of the new moon and great weather. I have many more images in the works. In fact, I'm starting to acquire more data than I have time to process. Actually, it just means that I get "picky" about what objects I process. Some that I feel are sub par I simply shelve. I'll have more coming in the next day or two so keep watching. 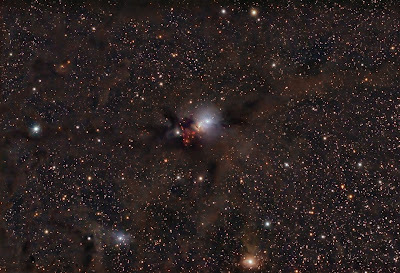 Actually this is IC 2087, the center reflection nebula, while the rest of the real estate is mostly taken by the dark nebula Barnard 22. I took this 4 hour exposure during Oki-Tex. Although it does not have the "zip, pow" color of other nebulae, I really love the haunting beauty of these subtle dark forms (my wife thought this one looked like a ghost). Its interesting how people see different things in these cosmic forms -- like an ink blot test. One person commented that it looks like the Enterprise is bursting through the cloud. What do I think it looks like? It looks to me like ET wearing a Burka (with his little heart-light glowing). This is NGC 1333 located in Perseus. 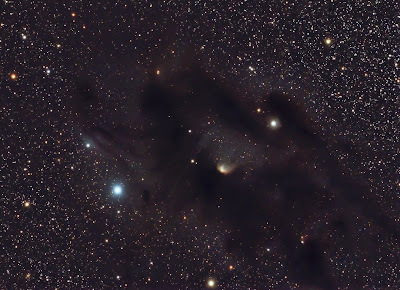 It is a large dusty region and reflection nebula. It also has a fair amount of new star-birth happening (those red "knots"). Just a lot going on in this area -- very interesting. I would like to re-visit this area again with a longer focal length scope to explore in detail some of these local areas in close-up. This is another image I took at Okie-Tex. It is just under 3 hours exposure. A good friend was feeling down lately -- nostalgic for his youth, fearful of the state of the world, doubting his abilities, etc. You know, stuff most of us feel from time to time. I know I certainly am guilty on occasion. But a good remedy for me is to simply look up. Get away from the crap. Get out under a dark sky full of stars and look up and you find amazing sights like the image above (okay, you need 3 hour exposure if you want all the color), but there is so much you can see -- even with binoculars or naked eye. And for me it really rekindles the awe and sense of wonder of being a kid. It puts things in perspective. The universe is forever mysterious and exciting! Incredible distances, enormous sizes, amazing processes, and we can see it all! How did all this happen? Where is it going? Ever feel like the "magic" is gone? Just look up... its up there! Okay, maybe not exactly a worm, but it is VERY dusty and worm-like (and I did shoot this in Oklahoma). 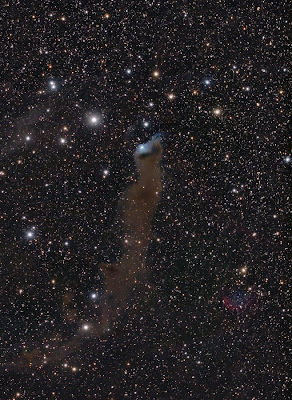 This is VDB 152, a dark reflection nebula in Cepheus. I think it is really beautiful. 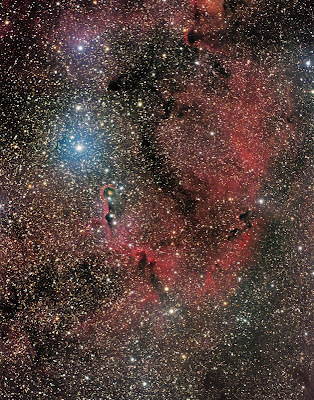 The clouds of dust are simply passing through the bright star at the top "mouth" of the worm. The light from the star reflects blue upon the nebula. I really like these reflection and dark nebula types -- they have a lot of depth and dimension. They also look kinda spooky and mysterious. This image was taken from Okie-Tex. Total exposure time through the FSQ 106 was a little over 2 hours. 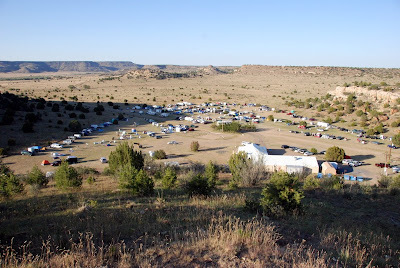 This is Camp Billy Joe in the Black Mesa area of the Oklahoma panhandle. 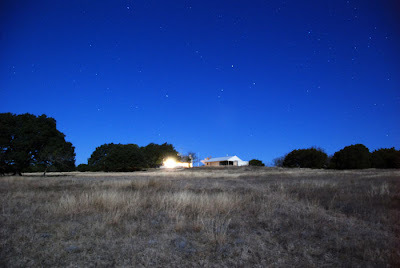 It is actually a Christian Youth Camp that the Oklahoma Astronomy Club rents once a year to hold its annual star party. It is kind of ironic that this site hosts a bunch of science-loving "Big Bangers" each year, but it is also pretty cool. I mean, no matter what one believes regarding the "how and why" of the origin of the universe, most folks simply agree that the universe is beautiful, mysterious, and a marvel to behold. Under the amazing canopy of stars, it seemed to me that science and faith were both right at home. Okay, so I haven't gone camping since I was in college. But I decided to buy a tent and go "old school", avoiding the bunkhouse that was available in exchange for some privacy, solitude, and NO snoring! 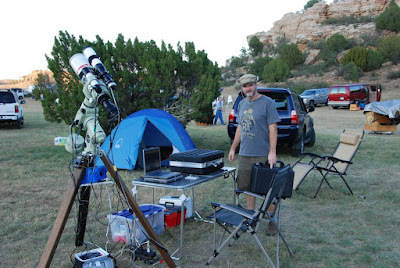 This was my home away from home with my tent set-up just a few paces from my telescope. And while I did have privacy, I could still hear my neighbors snoring in their tents. 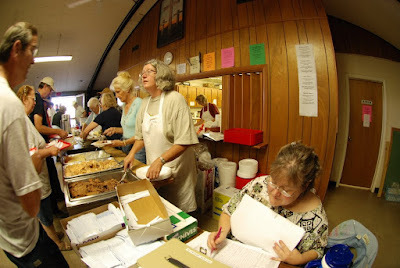 Twice a day they rang the dinner bell and folks would make the short walk to the lodge where food was served and the vendors hung out. The food wasn't bad and the decor was amusing -- on the wall next to the chow line there hung religious paintings, as well as large syringes and signs about getting rabies vaccinations. 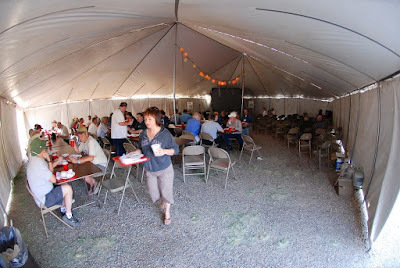 A big tent served as dining hall and presentation area for the guest speakers. They also had Internet connections. Of course, the main draw was not the food or camping facilities but rather the incredibly dark skies. 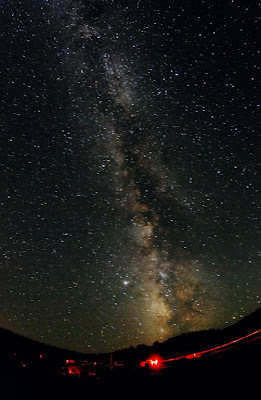 Here is shot of the Milky Way I took with my Nikon. As you can see, very clear and very dark. Just perfect weather! Astronomy, and astrophotography in particular, demands that you stay up all night until the sun comes up and puts an end to your work. It is sometimes hard to stay awake, and often you hit "the wall". 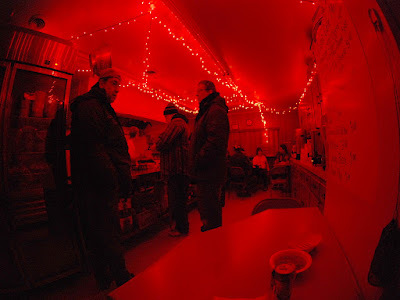 My favorite remedy was a trip to the Cosmic Cafe -- an all-night grill serving burgers, frito pie, green chili stew, grill cheese sandwiches, and hot and cold drinks until 3am. 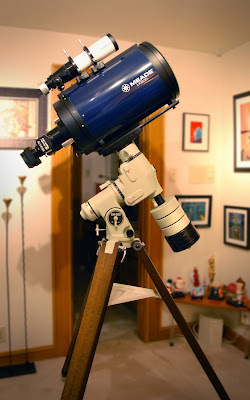 Perfect for the astrophotographer! The red "submarine-like" lighting scheme is to protect your dark adapted eye (it takes up to 40 minutes to get completely dark adapted, so light restrictions are important). As you can tell, I had a great time at this event. I am looking forward to returning next year, as well as exploring other similar events in the region. Next up... new astro images! Wow, wow, wow! I just got back from my first big "star party" -- the 25th Okie-Tex Star Party that was held in the Black Mesa area of the Oklahoma panhandle. It was a 9 hour drive from Big D but totally worth it. I tent camped for 4 days under some of the darkest skies in the country... and the weather was perfect! It was incredible. I saw stuff I've never seen before... like the Zodiacal light and the Gegenschein (more about those later). Expect a full report (with pics) coming soon. I also did LOTS of astro-imaging on multiple targets, so I will have a steady stream of new astro images to share very soon. In the meantime, here is a shot I took of some "star trails". This is done by simply taking a LONG exposure from a fixed camera on a tripod pointing north. 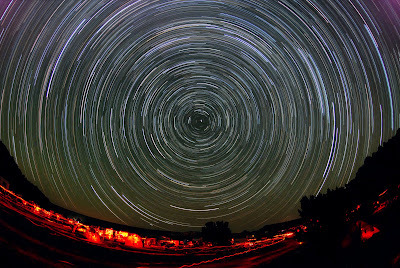 As the Earth rotates, the sky seems to spin and thus blurs/streaks the stars. All the red lights are from the flashlights of folks in the field. It was an exhausting trip, but completely cool. I'm hooked! 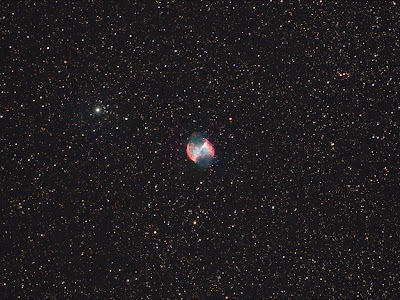 This is the Dumbbell Nebula, otherwise known as M27. What you are looking at is the massive amounts of material being ejected from a dying star. As the star burns out its fuel it begins to cool and lose mass, collapsing and exploding. What a way to go! Although it has the nickname "Dumbbell", I think it looks more like an "Apple Core". Hence, I am starting an international movement to have it re-named. If you want to support this movement send as much money as you can to me and I will make sure it is put to good use (in the name of science of course). This image started out as a test: new focal reducer, new HA filter, new processing scheme, etc. I shot this target on two consecutive nights from my heavily light polluted home in Dallas (and with a full moon). The first night I shot RGB color with my Reducer Q, then the next night I shot HA (Hydrogen Alpha wavelength) without the Reducer Q. I registered and combined these data sets to yield the image you see here. I was really surprised by how much good data I got -- the HA filter REALLY helps enhance the RGB (and is impervious to light pollution). Most folks use long focal lengths to get a lot closer to this target, but I was happy to keep it in this WIDE field. It is like a little colorful island in the abyss. Be sure to click on the image for a larger view! Okay, so the moon is blazing high in the sky again. My imaging stops for a couple of weeks until the skies grow dark once more. It is time to clean and repair gear, learn new tools, and review some recent events that may have slipped through the cracks. Last month, Kim and I spent a week in Colorado -- a convention in Denver, visiting family in Colorado Springs, and then fly fishing in Creede. 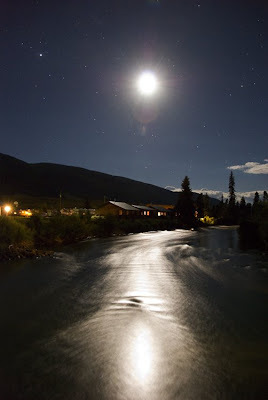 I took my camera along (naturally) and did a bit of shooting at night around the Antlers Lodge in Creede. This first one is taken from a small suspension bridge over the Rio Grande. You can see Sagittarius and the tail of Scorpius framing the moon. The Perseid meteor shower happened to peak my first night there! Fortunately it was clear and the moon set early. I got up around 4 am and watched the shower. They came in waves. A couple of times I saw 4-5 meteors at once. Cool! 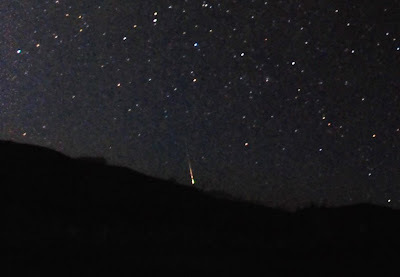 Of course, I tried to capture a shot of a really spectacular Perseid Meteor. It is always a matter of luck and proper timing to be taking an exposure when one flashes across your field. I missed some good ones, but did manage to capture a small faint one on the horizon. Eventually, I noticed it getting lighter in the east. At first I thought it was my imagination. It did not seem late enough for the sun to rise. I forgot the sun rises earlier in Mountain Time. 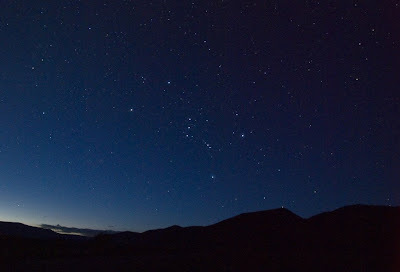 So my viewing came to an end, but not before I saw Orion rise just ahead of the sun. It was really beautiful. 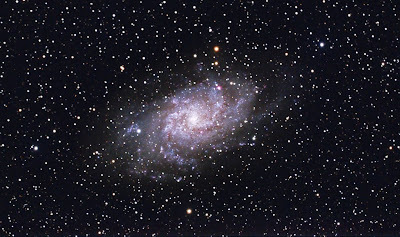 This is the Traingulum Galaxy, otherwise known as M33. It is a fairly large spiral galaxy close to Andromeda. You can see the dark brown dust lanes and the red "knots" where there is ongoing star formation in the spiral arms. I hope to add some Ha (Hydrogen Alpha) data to this image at a later date. This requires additional long exposures with a narrow band filter that allows only hydrogen emission wave lengths. What the hell does this mean? This image was taken in Atoka with my normal rig (FSQ 106, QHY8 camera) and a 3 hour exposure. Otherwise known as the Pleiades, or M45, this classic asterism (association of stars) is plowing through a vast cloud of dust, yielding some beautiful blue reflection nebulae. 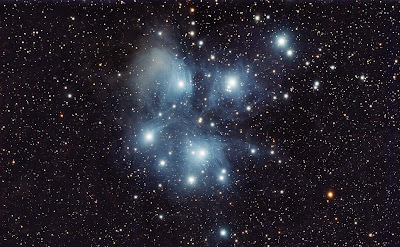 Why the "Seven Sisters"? Well, first there are obviously more than seven. But I suspect when the lonesome and bleary-eyed Greek shepherds looked up they could only count seven stars. And since they were indeed lonely shepherds, these stars looked like beautiful women. I'm sure they named all kinds of things after women -- piles of rocks, trees, mud puddles, clouds, etc. Did I mention these guys were lonely? But indeed, this is truly a beautiful object. And in fact, one can easily see it with the naked eye (even in light-polluted Dallas). While it requires a long exposure to pull out the nebulosity, the star asterism itself is easily seen, and even better through binos! I was really happy with the way this image turned out. It is over 3 hours of exposure, which gives a lot of detail on this bright object. How's that for a "trippy" header? So, I went back to Atoka last Thursday and Friday night. My ol' pal Richard Allen got some much deserved time off work and expressed interest in wandering around in the dark, so he was my astro buddy on this trip. We had the place to ourselves on Thursday and the skies were great. I was hunting for LDN 1222 -- a small Dark Nebula near Cassiopeia. It is a little "off the beaten path" and a bit of a challenge to find. But it was the "Challenge of the Month" on the Cloudy Nights forum, so I took up the gauntlet and gave it a shot. This is my wide field image of the area around LDN 1222. The actual target is that small dark patch hugging the upper center border. I was not totally sure I got the right target until checking this image against my charts later the next day. I composed for the larger Emission Nebula in the lower left, and those cool tiny Dark Nebula "squiggles" in the center of frame. This is a really interesting area, but very hard for me to process (it took all day in front of Photoshop to pull out the data). While clear, the skies were very humid and hazy and it gave me some light pollution vignettes that corrupted my colors -- took a bunch of time to balance things out (time to invest in some filters). Plus, I had no images to use as reference. I just had to "wing it". But I think I got close to a good "naked eye" version of this area. LDN 1222 was exposed with 17 x 10 min subs (just under 3 hours of data). Later that same night, I managed to get a good shot of the Pleiades. So, that was Thursday night. On Friday we were joined by my pal Max (and briefly by Terry, also from the club). Friday night I shot M33. Up next: Images of the Pleiades and M33... stay tuned! Sorry, I just can't leave this object alone -- it fascinates me! I really think it is beautiful. I re-processed the data and tried some new techniques (and software). I am very pleased at the color and level of detail I extracted this time. This image is a 100% crop of a much larger original frame. Again, I'm happy the detail really seems to hold up well (and with very little noise) at this 1:1 scale. Be sure to click on the image for a closer look! Hello astro fans! You may recall that I imaged the Western Veil a couple of months ago. At that time, I was still using my noisy Nikon camera and was unable to autoguide (for longer exposures). Well, here is my second attempt at this target. This time I was armed with my QHY8 camera and autoguiding was in full effect. I shot 18 x 10min exposures (3 hours) worth of data. I also framed differently to include the faint nebulosity just under the main Veil at top. You will notice a subtle "triangle" shape in the lower left nebulosity -- this is called Pickering's Triangle. I never knew it until somebody complimented me for resolving it so well (I just thanked him and acted like I knew what I was doing). Pickering's Triangle was discovered in 1904 by Williamina Fleming of the Harvard Observatory while examining photographic plates of the region. The object was named in honor of her boss, astronomer Edward Charles Pickering. I think that was overly nice of her. I think it should have been called Williamina's Triangle. I mean come on! Williamina found the damn thing! Who knows, maybe she was bucking for a raise. Anyway, it is a very cool big ol' supernova remnant in the Cygnus area. This is NGC 7293, otherwise known as the Helix Nebula. The Helix is a planetary nebula. No, it has nothing to do with planets but it is called that because of its round and "planetary" shape. These types of nebulae are created as stars die and release material as they collapse. Look closely and you can see the star in the center (the creator of this nebula). I shot this image from my last Atoka trip on August 2. It is about 3 hours of exposure. I've still got a couple more images in the works, so keep watching! I'm playing "catch-up" since Kim and I have been out of town for the past week. We went to Colorado (I'll also have a couple of shots from that trip soon). Stay tuned! This is IC 1396, otherwise known as the Elephant Trunk Nebula. 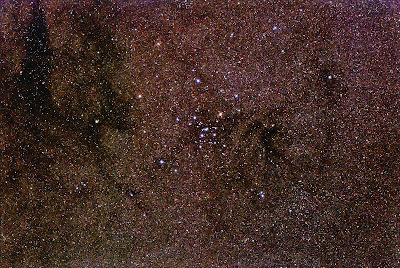 It is a very wide field image of the region, but you can see the "trunk" just to the left of center (it is pointing up). C'mon, use your imagination! This is another image I took from my recent session at Ranch Venado last week. 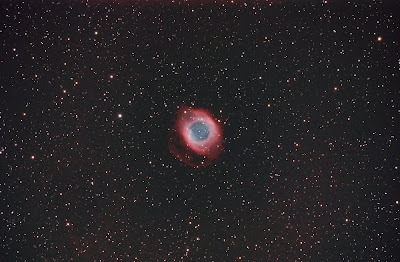 About half the data was taken through high thin clouds, but I am still pleased. This was about a 2 hour exposure. 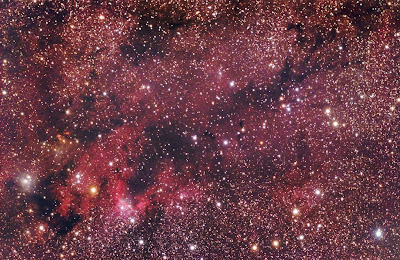 IC 1396 is one of the largest emission nebula in the night sky (I've just framed the central region). It is about 1500 light years away in the Cepheus constellation. I had quite a busy week last week! I also went back to Atoka last Saturday night and have a couple more images in the works -- check back soon! 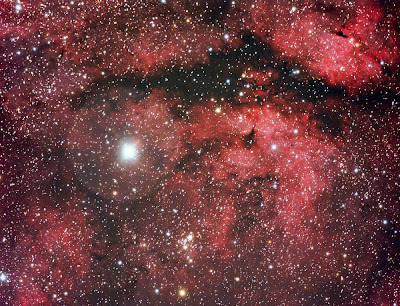 Gamma Cygni Nebulosity -- that's just fun to say! Well, guess what I've been doing? Yep, the moon is taking its leave so out to the dark skies I go! I went back to Ranch Venado for a couple of great nights Monday and Tuesday. I tried to go down Sunday, but my new truck took a dump (the on board computer fried) about 70 miles from home in 106 degree heat (loaded with all my gear), and I had to get a pricey tow truck ride back to Dallas -- bummer. But I am nothing if not stubborn, so I borrowed my folks truck and reloaded and headed back the next day. And it was worth it! My astro buddy max was working at Fort Hood (about 40 miles away), so he came out both nights. We stayed up until sunshine both nights, taking advantage of the good skies. While max focused on the Cocoon Nebula, I aimed at the Gamma Cygni Nebula and the Elephant Trunk (coming soon). Anyway, here is my Gamma Cygni. It is approximately 7000 light years away. The brightest star (Sadr) is not actually part of the nebula, but resides in the foreground about half way between us and the nebula. This was the first trip I was actually able to use autoguiding (using a second scope and camera attached to the main scope that tracks a "guide star" and allows for VERY precise tracking and longer exposure times). This image is the result 18 x 10 min exposures... 3 hours total. Just got back from a trip to Rhode Island. Kim and I visited our friends Bob Eggleton and Marianne Plumridge (Bob and I are working on a top secret project... shhhh)! 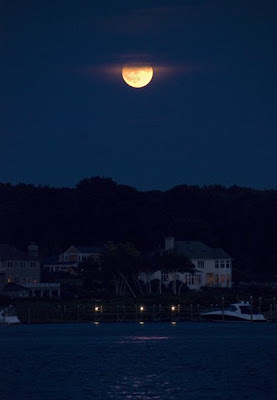 Of course, I am always on the lookout for celestial spectacles so when the near full moon began rising over Newport I snapped some pics. Usually the moon is the bane of astrophotographers (since its light washes away the dim deepsky objects), but on the other hand, the moon is a wonderful object unto itself. In fact, many astronomers and astrophotographers devote themselves almost exclusively to it. At any rate, it was a beautiful site last Friday night. But regardless of its beauty, I am counting the days until it goes away so I can get back to some deepsky targets again next week! 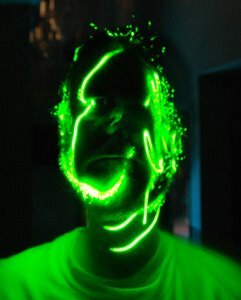 My wife Kim once remarked that I looked like a "mad scientist" with my glowing astro gear in the middle of a field late at night. It does seem a bit crazy at times to drive way out in the middle of nowhere, set up all this hi-tech gear in a dark field, and stay up all night until the sun comes up. But like the song says, "if doing astrophotography is wrong, I don't wanna be right". That was a song, right? Anyway, this pic is me at around 3:00am in Atoka about a week ago (when I shot M101 and the Iris -- I'd be shooting the Iris at this point). No, my laptop is not electrocuting me -- this was a 60 sec. exposure, and those "electric arcs" are just my red flashlight. It's kinda strange. Shooting this astro stuff really reminds me of the old days of shooting animation on the big Oxberry camera. It was a similar vibe -- shooting in the dark, late at night, constantly checking your settings, never really knowing what you have until the images are "processed" later. Ah, the more things change the more they stay the same. Hmmm... maybe I was a "mad scientist" in a previous life. 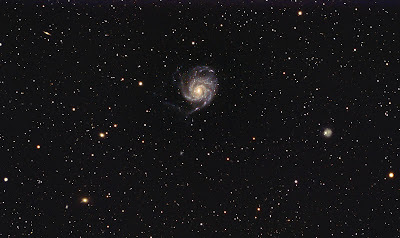 This is M101, otherwise known as the "Pinwheel Galaxy". This sucker is BIG -- we're talking 170,000 light years in diameter big! Imagine that... if you could travel at the speed of light (186,000 miles per second) it would take you 170,000 years to go from one side of this galaxy to the next. Dude, that's seriously big. This is the Iris Nebula (NGC 7023). It is a reflection nebula in Cepheus. 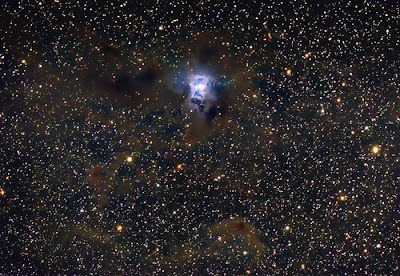 The bright star in the center shines light on massive clouds of dust, yielding a blue reflection. 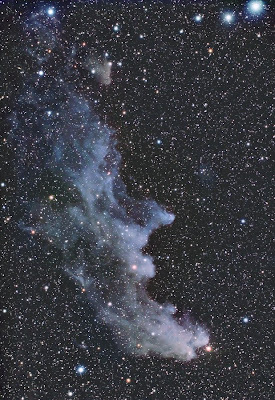 Other dust clouds serve to obscure the region and dim the surrounding stars. However, if you look closely you'll notice the clouds have a slight luminous Red tint -- the dust itself emits infrared radiation, and a low level red light enters the visual spectrum. Anyway, I went back to Atoka last Saturday night armed with a new astro-camera, the QHY8. It uses a 6 megapixel Sony chip (the same as in some Nikons), but it is super cooled to -20C, works at 16 bit, and is tuned to take loooong exposures of faint objects. And the best part is IT WORKS! Man, I'm loving this camera. It is virtually noise free. So I spent another all night session imaging. There were a bunch of folks up at the site. We ate ribs and stargazed until the sun came up. I met a bunch of cool people. Really a great night. 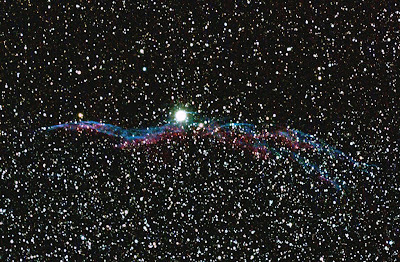 The Western Veil to be exact! 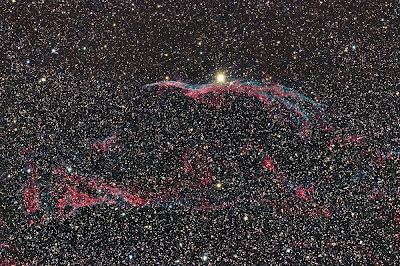 The Western Veil is part of the larger Veil Nebula -- a supernova remnant from a star that exploded about 10,000 years ago in the Cygnus constellation (1,400 light years away). 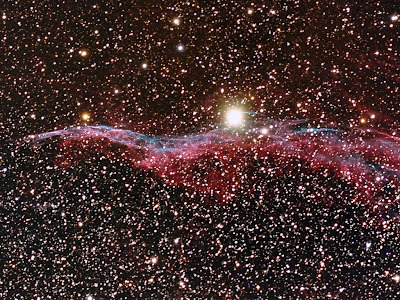 The entire object is also referred to as the Cygnus Loop. It is HUGE! 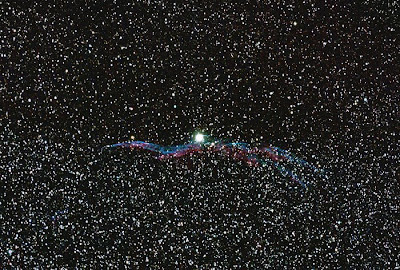 The Western Veil is also nick-named "the Witches Broom". Can you see it? I wish I would have taken longer exposures and it would be clearer. As it stands, I shot about 100 minutes of exposure time. 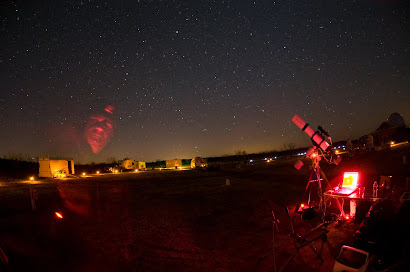 I took this shot from my first imaging trip to the TAS club site at Atoka, OK. It was a beautiful night! I shared the stars with my new pals Max and Jim. We shot and observed until the sun came up and washed-away the stars. Cool. 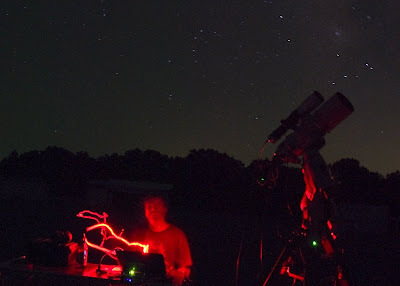 I joined the Texas Astronomical Society (TAS) at the first of the year and have enjoyed their meetings (great speakers) and their local star parties. Yesterday I finally made it up to the club's "dark site" property in Atoka, Oklahoma (only about 1.7 hours from Dallas). No, that is not a pic of a weird church next to a cemetery -- it is the Al Bowen Observatory next to part of the viewing field (those are not "plots", but rather concrete pads and power poles for setting up telescopes in the field. I went to the site with Max, the club VP, to do some painting and general maintenance to the dome. Here are the stairs leading up to the dome -- it looks like a submarine. The red lights are used everywhere to preserve one's dark adapted eye at night. Inside the dome, Max inspects our re-painting efforts. He is a very cool and interesting dude. We had a good afternoon of philosophising. That scope is a big 16" Meade SCT. I look forward to heading back to the site at night and taking a peek through that sucka! The Otaka site is FREE to all members of TAS. What a deal! While sitting under the stars during an astrophoto session, one hears all kinds of "sounds of the night". On May 31 about midnight I heard some strange "crying". I thought it was a wounded rabbit. About a half hour later a deer started snorting at me from some nearby cedar trees. It was totally dark (no moon) and I could not see anything. Deer use this loud snort as an alarm as they dash away from danger, but this deer was not leaving. She kept snorting and circling me (unseen) for a good thirty minutes. I was amused but thought nothing of it. The next morning, Kim got up to let the dogs out and came running back inside all alarmed! I thought there was a rattlesnake in the yard. Instead, we found a tiny newborn deer in the fire pit! The little critter was just a day or so old and didn't even have its eyes open yet. Evidently it got lost and fell into the fire pit and couldn't get out. So, THAT was the crying I heard the night before. And now the "snorting deer" made sense -- mama was looking for her baby and I was in her path. The fawn was really exhausted and I thought near death. It has hot outside, already close to 90 F. I cooled her down with some water (she was to young to know how to drink) and set her in the shade. Then she surprised me by standing up and wobbling down the hill, crying for mama again. She had some life left in her yet! So I decided to take her to the cedars at the bottom of the hill to the north of the house where I knew mama and other deer generally hang-out. I sat her under a tree and Kim and I went to town for lunch and to buy a baby bottle to try to get some fluids in her. But when we came back a couple hours later, she was gone. Wow, this was a LOT of fun to shoot! 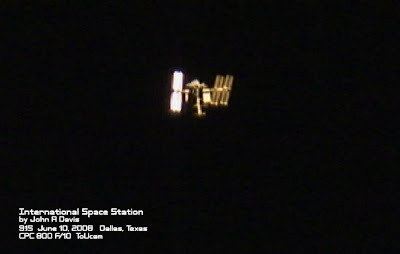 This is the International Space Station (ISS) with the Shuttle docked on top. It came zipping overhead here in Dallas last night around 9:15 at 80 degrees above North. This sucker moves quick! It was a really bright Mag -2 and looked like a super bright plane. It was only visible from my atrium for a little over a minute. I shot this with a simple ToUcam webcam attached to my CPC 800 telescope. As soon as it started overhead, I manually chased it around the sky and recorded an 800 frame AVI of it zipping in and out (mostly out) of my field of view. But I managed to catch about 20 images of the ISS. This is the best one. This is the first time I've attempted this and didn't know what to expect, so I am very happy with the results. It is SO COOL what goes on just right above our heads. It amazes me that you can simply look up and see space stations flying overhead and actually take pictures of them! I am still processing the data from my recent trip a week ago to the ranch. I just finished my first image of Jupiter. I did not catch the famous Red Spot, but I did get the moons: Io, Ganymede, and Europa. Here is a closer look at the Jovian Giant. Many of the bands are clearly visible. These images were taken with a simple webcam and a Powermate 2X magnifier through my CPC 800. Approximately 400 frames from the resulting AVI were registered and stacked in the Registax program (a very cool FREE application)! 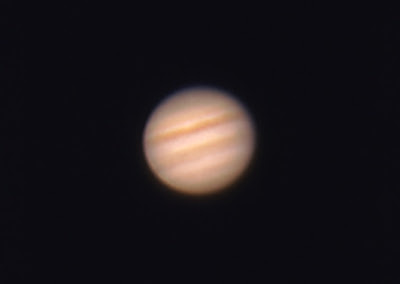 I hope to make more/better images of Jupiter and capture the Red Spot, along with some transiting moons. Trifids, Whirlpools, Lagoons, and Greek Philosophy!! Wow! What a great weekend at the ranch! 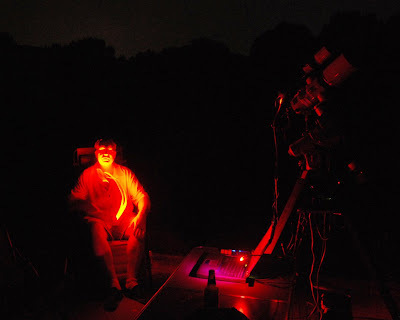 I finally took the new TAK scope and mount out for an imaging session under great skies. I did my first polar alignment, so I'm not a polar virgin anymore. It was actually pretty easy using the Takahashi mount's polar scope to dial-in Polaris and the requisite off-set. So I was good to go in no time. 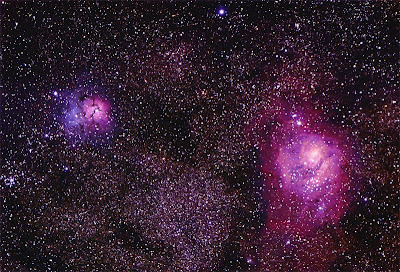 Here is my first success -- the Trifid Nebula (upper left) next to the larger Lagoon Nebula (lower right). Actually, the Lagoon is too large for me to capture all of it with the Trifid. Part of it is cropped-off. I'll probably take a photo next time of just the Lagoon. This area of the sky is looking directly towards the hub of our Milky Way galaxy -- lots of stars! In fact, the Lagoon Nebula is a big "star hatchery". There are two main types of nebulae -- reflection and emission. The Trifid is a good example of both! The Blue areas are reflection and the Red are hydrogen emission. Actually, there is a lot more hydrogen emission nebulosity than my camera is able to capture (since commercial cameras have hydrogen blocking filters for terrestrial photography). Guess what my next upgrade will be? 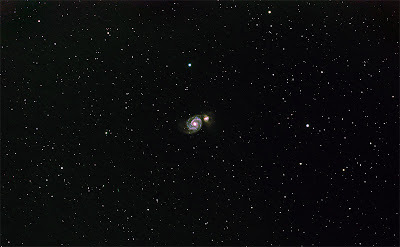 Here is a wide-field image of the Whirlpool Galaxy. I tried imaging this before with my older set-up but could not get enough exposure. Here I have MUCH more light. I like this wide view. As incredibly huge as this galaxy is, it appears almost petite in the vastness of space. Anyway, the cluster is the loose bright star grouping in the center. The "clouds" in the background are actually millions of stars (I've counted). Again, this is looking towards our galactic hub -- a VERY dense region! I was up all night 2 nights straight shooting and observing. It was awesome. I'm still looking at my data. I'll have my first image of Jupiter coming soon! Heading to Rancho Venado this weekend for a test drive of the new TAK rig and hopefully acquire some cool wide-field targets! Although I am still putting things together (got my At-66 guide scope, but still waiting on the mounting hardware and guide camera) I should be able to take some decent unguided shots and test the EM-200 mount's tracking. Although I've been testing the rig, this will be my first opportunity to do an actual polar alignment with my polar scope on the EM-200 (can't see Polaris from the house in Dallas -- big north wall in the way). Hopefully I'll have some eye-candy to post next week . Wish me luck and check back soon!